DOSAGE GUIDELINES Low - 1ml per day per 50 litres Med - 2ml per day per 50 litres High - 5ml per day per 50 litres *Dosage assumes high plant biomass. For best results dose daily and combine dosing with a 50% water change per week. One capful equals 10ml approx. Syringe included to aid accurate dosing. • The instructions are designed for dosing daily, better for plant growing. • The instructions include different dosage rates for different set-ups. • A syringe is included for dosing small aquariums i.e. 1-5ml per day. • The cap is exactly 10ml when full. • It comes in an opaque white bottle, which means sunlight won't effect the liquid. • The liquid does not contain any colouring so has minimal effect on water clarity. • It contains every nutrient required for aquarium plants in an ideal ratio to suit all tanks. No need to add anything else. • A tried and tested fertilizer. Professional UK Aquascaper George Farmer has been using it for 12 months to grow his own plants in a number of personal aquascapes. 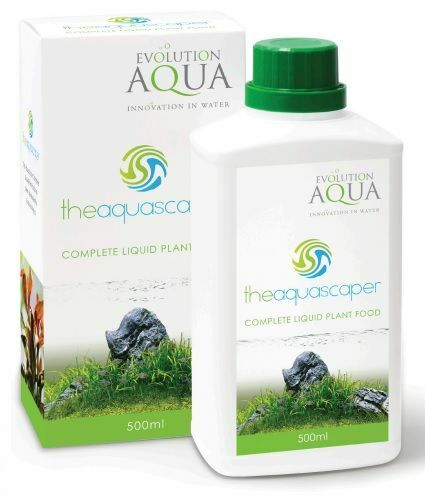 I've been using the Aquascaper complete liquid plant food for the last 9 months and have had brilliant results in my high tech jungle scape at the maximum dosage as well as in my low tech Ryuboku scape at the minimum dosage. I particularly like the easy dosing method and the fact that it is a complete fertilizer with a syringe included. Looking forward to seeing a larger bottle size in the future. Brilliant fertilizer. Have waited to do a long ter review on this and the results are amazing. I run a high powered tank with lots of co2 and light and have been dosing this daily. Would highly recommend. Works well with red plants and doesent cause algae like most I’ve tried. Will deffinately be buying again after this bottle runs dry. Superb!!!! I have a low tech (no co2, no carbon) tank with various Anubias, Cryptocoryne beckettii and Microsorum pteropus narrow and the health of the plants has increased beyond belief. All have new leaf growth and a healthy gloss since using this product for just over 2 weeks. Up until now I have avoided using ferts containing nitrates and phosphates but despite having a little green algae on the heater and Anubias before using The Aquascaper Complete Liquid Plant food I have not seen any increase. One of the best features is that it doesn't stain the water as it's almost a clear liquid! Highly recommended!!! !